On Saturday, August 20, 2016 Emerging Green Builders joined together as they tour Toronto's green roofs by BIKE. EGBs came to network with green building experts, be inspired by Toronto’s green roofs, and embrace pedal power. The tour focused on buildings within the Greater Toronto Area with exceptional sustainable features, providing attendees with the opportunity to learn and be inspired. Please meet at the large Toronto sign in Nathan Phillips Square for registration. Brand new construction and fully accessible, having officially opened only a few months ago. The green roof was constructed by Restoration Gardens and local volunteers. The Green Roof Innovation Testing Laboratory, or GRIT Lab, is located at the University of Toronto, John H. Daniels Faculty of Architecture, Landscape, and Design. A platform for multidisciplinary collaboration, GRIT Lab links the fields of Landscape Architecture, Biology, Hydrology and Building science, with the goal of investigating the environmental performance associated with ‘green’ & ‘clean’ technologies such as green roofs, green walls, and photovoltaic arrays. Enwave is the largest provider of district cooling from a renewable resource in North America, with over 30 buildings connected to the system and capacity to serve an estimated 100 buildings. 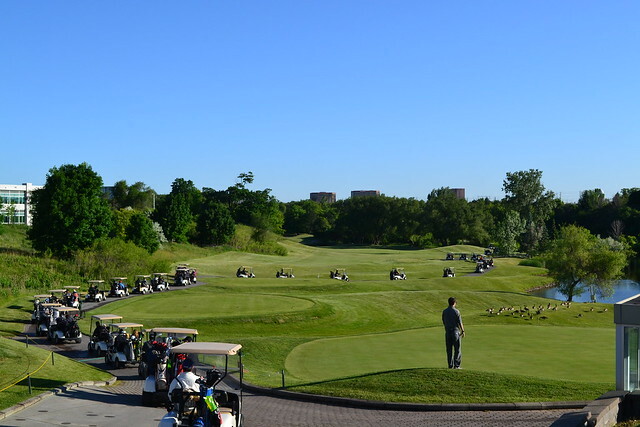 On June 9, 2016 was our first annual Drive for Change Golf Tournament at the Royal Woodbine Golf Course. Participants enjoyed a morning of golf, and finished off the afternoon with a hearty lunch and raffle draw for some amazing prizes. Guests took this excellent opportunity to network with fellow delegates, clients, friends and business associates at the close out of the 2016 CaGBC Building Lasting Change Conference. On June 8, 2016, attendees of the Building Lasting Change Conference ended off the week with the Annual Chapter BBQ at the Allstream Centre. Chapter members and green building supporters from accross the country took the opportunity to cement relationships established over the conference! The facility is expected to join a short list of 12 buildings worldwide, in meeting Living Building Challenge (LBC) requirements, recognized as one of the world's strictest environmental certifications. Waterfront Toronto is the public advocate and steward of waterfront revitalization, this project is one of the largest waterfront brownfield revitalization projects in the world. Revitalizing Regent Park involves demolishing all existing buildings and replacing with new rental buildings creating and updating parks and carving out space for community groups and initiatives. Previously the Pan Am Athlete's Village and currently Toronto's newest neighbourhood located just east of Downtown Toronto. All buildings in this new neighbourhood are targeting LEED® Gold Certification. This tour included a visit to Cisco Canada's new Headquarters, housed in Oxford Properties' LEED® Platinum (targeted as of January 2016) RBC WaterPark Place and allowed participants to learn the process behind the application, from the very first Canadian pioneers, Menkes Property Management Services. 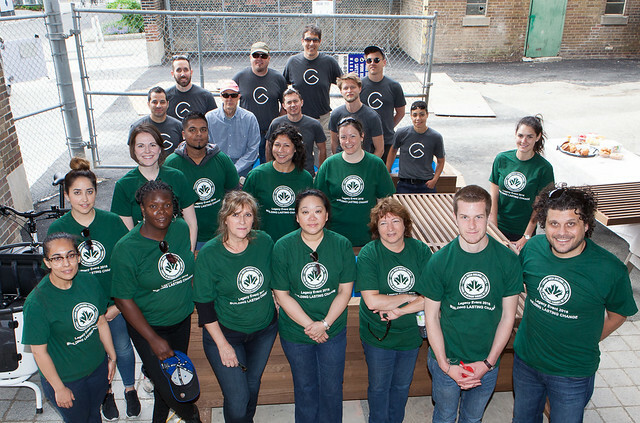 On June 6, 2016 CaGBC’s annual Legacy Event took place, it provided conference delegates from the 2016 Building Lasting Change Conferene with the opportunity to volunteer their time and skills to leave a lasting legacy for a community project. This year, Eva’s Phoenix: a transitional housing residence for 50 homeless youth, was selected as the Legacy Project. Delegates teamed up with the CaGBC to ‘bring the outdoors in’ at the new Eva’s Phoenix location. 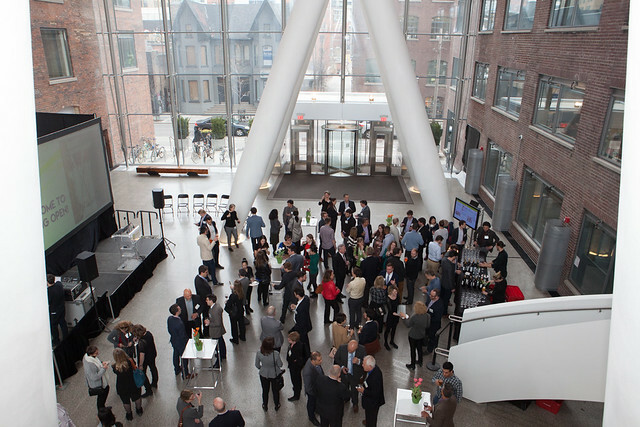 On April 28th 2016, guests gathered at the brand new Queen Richmond Centre West building for networking, drinks and hors d'oeuvres, followed by our crowd pleasing Building-Blitz – 6 rapid-fire presentations highlighting the newest and most sustainable buildings in Southern Ontario. This Toronto Community Housing attained LEED Gold for New Construction. This project was presented by WSP | MMM Group Limited. The Forensics Services and Coroner's Complex attained LEED Gold for New Construction. This project was presented by Stantec. The Regent Park Community Center, aiming for LEED Gold, was presented by CS&P Architects. The 2016 Legacy Event, a Chapter-run event, helping to "bring the outside in" at the new Eva's Phoenix facility. This project was presented by Greening Homes. On May 5, 2016 participants gathered at The Craft Brasserie and Grill for the opportunity to meet and interact with some of Toronto’s foremost leaders in the green building industry. Leaders in green construction, architecture, consulting and more came out to meet with industry up-and-comers to share their stories and advice for career development. Participants were placed into small groups and had the opportunity to sit down with each of the leaders. The night was complete with a drink and hors d'oeuvres. Mandatory building benchmarking comes to Ontario! The provincial government has introduced amendments to the Green Energy Act to enable the implementation of the Ministry of Energy’s proposed large building energy and water reporting and benchmarking initiative, which will help Ontario’s large building owners manage their energy and water consumption and save money on their utility bills. This was our first LEED Breakfast Session of the year and got to hear experts weigh in on what mandatory building benchmarking reporting means, how it works and what this means for your organization. Was eligible for 1.5 CE and OAA hours. The 2nd annual Green Homes Summit was on January 28, 2016. This was a one-day, regionally-focused education sessions for developers, builders, designers, architects, and anyone involved in building ‘better than code’ housing. This Greater Toronto Chapter's Green Homes Summit focused on residential construction and covered both single-family homes (including townhomes and various attached styles) and multifamily projects up to the midrise level (up to 12 storeys). The Summit also included sessions on LEED Canada for Homes, and many regional energy and green building standards. Eligible for both 8 GBCI and OAA hours, course code will be sent to attendees after the Green Homes Summit. One Planet Living, Alex Speigel, Windmill Development Group Ltd. Please click here for information on the 3rd Annual IIDEX Woodshop.